Though Ford decided not to offer any big unveilings at the 2013 New York Auto Show, Shelby American came with a tuning kit based on one of its pickups, the 2013 Ford SVT Raptor. The kit adds enhanced power and handling, and a specially designed exterior and interior. Shelby installed a 2.9-liter Whipple supercharger onto the standard 6.2-liter V-8 engine in the Raptor and a new Shelby Stinger exhaust system. As a result, the engine’s output jumps from the standard and already awesome 411 horsepower up to a total of 575 horsepower. The engine is mated to a six-speed automatic gearbox that transfers the power to all four wheels. 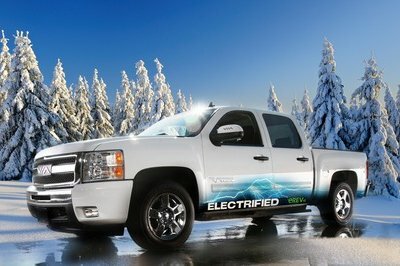 Additionally, an "Off-Road" mode that calibrates the transmission, stability and traction control systems for optimal operation at high speeds off road. The package includes a set of Shelby side fender heat extractors to keep the engine cool and make the truck look downright sweet. Also included for the exterior is your choice of one of three Shelby graphics packages – Traditional, Shelby Splash and Shelby Super Snake – so everyone knows that this isn’t any old SVT Raptor. On the inside, the base kit comes with a custom interior that includes two-tone leather with contracting stitching, a serial numbered dashboard badge, and boost and fuel pressure gauges to make sure everything is within spec. There are also a number of optional items you can add to the base kit, for a fee of course. 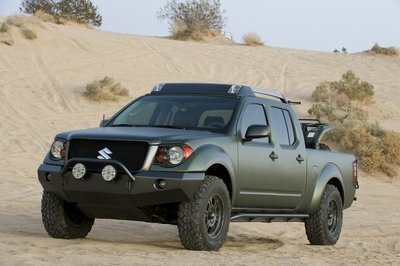 First up is an optional set of customs wheels wrapped in 35-inch Goodrich All-Terrain tires, a Shelby roof-mounted light bar, front and rear Shelby-spec bumpers, a spare tire and bed-mounted spare tire carrier. More options are coming down the pipe soon. The update package is priced starts at $17,995 – a relative bargain – and will be limited to only 100 units, so get to ordering. 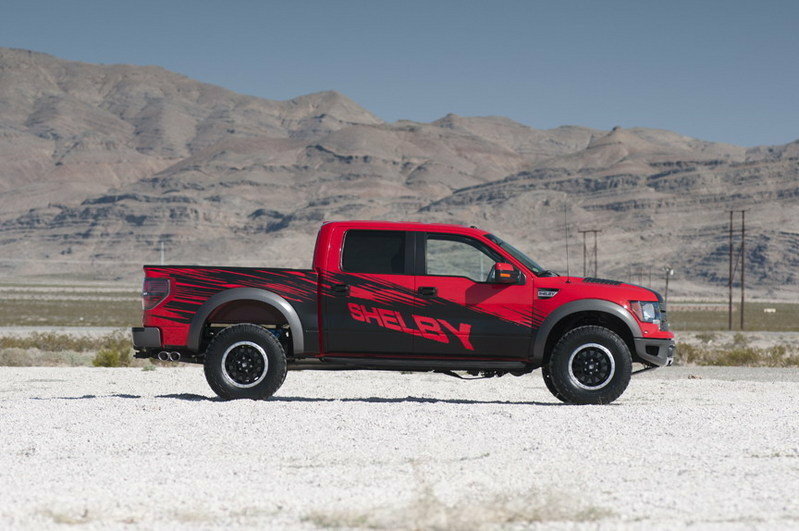 Click here to see the full Shelby Raptor brochure. 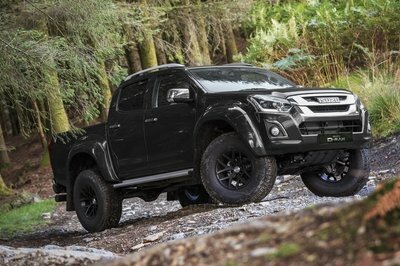 Shelby American, Inc. today unveiled the new Shelby Raptor, one of the most powerful, exciting and collectable off-road production trucks, during the New York International Auto Show. The Shelby Raptor marks the return of the Shelby muscle truck and is based on the 2013 Ford SVT Raptor with enhanced power and handling, topped with “Shelby Style” inside and out. 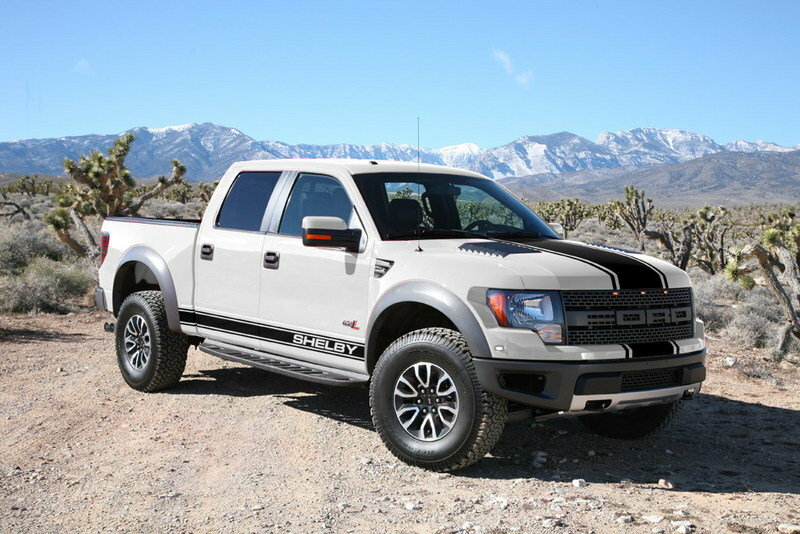 Shelby American takes the impressive Ford SVT Raptor and adds some “Shelby Magic” to create the ultimate muscle truck. By forcing air through a 2.9 liter supercharger mounted on the massive 6.2L V8 engine, and then out of the Shelby Borla exhaust system, Shelby American takes the stock 411 HP rating and kicks it up to 575 HP. A six-speed automatic transfers power to all four wheels and features a manual mode to give the driver complete gear selection control. Equipped with 35-inch Goodrich All-Terrain tires and optional custom wheels, the Shelby Raptor stays connected to any ground it faces. 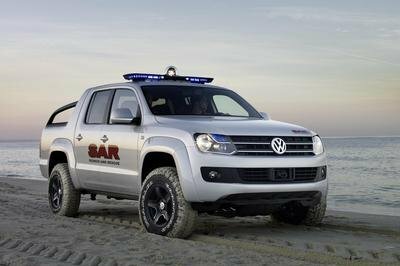 The “Off-Road” mode calibrates the transmission, stability and traction control systems to operate in harmony under high-speed off-road situations. In addition, any of the three Shelby graphics packages will help set it apart from every other rig on the road. 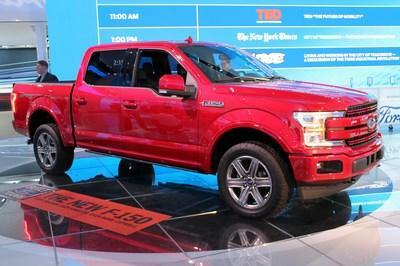 The post-title package starts at $17,995, not including the base Raptor. A limited production of 100 Shelby Raptors will be built per model year and each will be numbered and documented with a unique Shelby CSM number and entered into the official Shelby Registry.